Solar panel manufacturers and installers are no longer kings of the hill in solar. Solar energy installations have been growing at a rapid clip for nearly two decades now, but that doesn't mean that growth has been even for all solar companies. For a while, panel manufacturers were the high-growth market, then installers got hot as solar panel prices fell. Today, both manufacturers and installers are trying to stay afloat as global demand for solar slows down thanks to tariffs and incentive reductions in major markets like the U.S. and China. 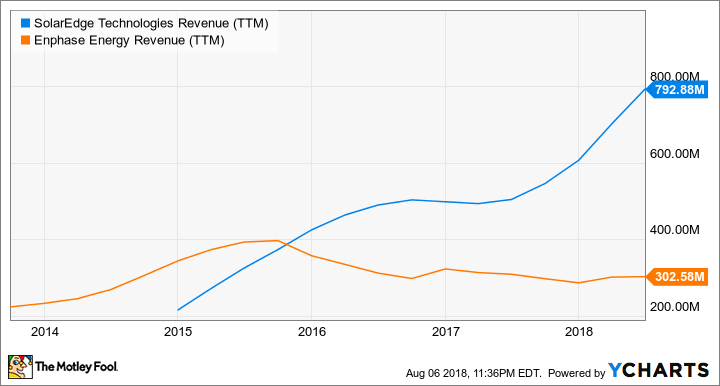 Two companies who haven't lost their growth edge are SolarEdge Technologies Inc (NASDAQ:SEDG) and Enphase Energy Inc (NASDAQ:ENPH), and there's reason to think they may be able to grow for years to come. The first thing to understand is what module-level power electronics, or MLPE, are. These are electronic devices like inverters or power optimizers that are attached to a solar panel before they're installed on a roof or other location. There's a distinct device for each panel, which is where it gets the "module-level" part of its name. MLPE are important because they increase monitoring and shut-down flexibility without getting on a roof and making a modification. If something goes wrong with a single panel, but not an entire solar installation, the panel can be shut down while still allowing the rest of the system to operate. What's really driving growth is that electrical standards (NEC 2017) are requiring MLPE for rooftop solar installation. That forces installers to use them, which has in turn forced solar panel manufacturers to start building MLPE into some of their solar panels. The downside is that MLPE is higher cost than centralized inverters. At worst, they can nearly double the cost of a solar panel, increasing an overall residential solar installation's cost by $0.30, or about 10%. But the mandate makes the cost a necessary one for installers. Both SolarEdge and Enphase are just beginning to scratch the surface of their potential. In 2018, GTM Research estimates there will be 104 gigawatts of solar panels installed worldwide or about 416 million 250 watt solar panels. That's the total potential market for MLPE to address. To pare the market back to reality, only about one-third of solar panels are on rooftops or small installations where MLPE may be mandated. Still, 139 million solar panels is a big potential market for MLPE products. In the second quarter, Enphase shipped 675,000 microinverters,and SolarEdge shipped 2.7 million power optimizers or an annualized rate of about 13.5 million MLPE units. As two of the top global suppliers, both companies have the capacity to grow rapidly before hitting saturation. You can see that SolarEdge has been the growth machine of these two, but Enphase's restructuring and new IQ 7 product could allow it to begin growing in earnest once again. What I think will supercharge growth is how MLPE products lead to more bolt-on products and services. As MLPE and inverter suppliers, they act as the "brains" of the solar system, which happens to be where value-add services like monitoring and energy storage are added. As additional services are built along with solar panels, they're well positioned to leverage their position in the market by expanding into new products. We've already see SolarEdge expand from an MLPE power optimizer leader into inverters, and both SolarEdge and Enphase have announced energy storage products. I think it's likely that energy storage will be a market they can easily grow into. No matter which company grows most, as leading MLPE suppliers, these are the companies I would bet on growing in rooftop solar over the next few years. We're starting to see both SolarEdge and Enphase Energy leverage their positions as MLPE suppliers into long-term contracts, and even new products. Enphase agreed to be the solar microinverter supplier to SunPower, and all indications are that IQ 7 products are selling well. SolarEdge has clearly demonstrated its growth chops. Many parts of the solar industry are seeing contraction right now, but these are two stocks that should grow for years to come.